This guide is intended for new installations in Amazon Web Services in a virtual private cloud (VPC). It does not cover migrating products to the cloud. The information outlined in this guide is applicable for all Orion Platform products that support cloud deployments. To reduce the number of places you have to configure your ports, SolarWinds recommends all cloud instances be in the same availability zone and in the same VPC. SolarWinds recommend using availability zones closest to your monitored devices. Use this deployment type when the majority of your monitored network is on-premise or if your hybrid environment is geographically diverse and use different availability zones. You can also deploy agents to your nodes in the cloud to reduce the amount of data transferred within the EC2 instance and from the EC2 instance to your main Orion server. You will need to create a virtual private network tunnel between the Additional Polling Engine (APE) in the Amazon EC2 instance and your main Orion and Orion database servers. This deployment is recommended when your monitored environment includes a significant number of on-premise devices or if you are migrating your infrastructure to cloud. These requirements use NPM licensing as a base for small, medium, large, and extra large deployments in Amazon EC2. These requirements use NPM licensing as a base for small, medium, and large deployments in Amazon EC2. As of Orion Platform 2018.2, SolarWinds now supports Amazon RDS as an option for your Orion database server. For more information, see Orion Platform Requirements. * EBS volumes are not your dedicated hardware. Consider using dedicated instances of EBS volumes for SQL servers. These requirements use NPM licensing as a base for medium and large deployments in Amazon EC2. Which components are you hosting in the cloud? Keep in mind the Amazon's pricing model and your estimated usage. If you intend to set up SolarWinds High Availability now or in the future, review the Enable High Availability section before setting up your cloud instances. The virtual private cloud (VPC) and port requirements are different and may be difficult to change in the future. Gather credentials Make sure you have all account credentials, such as your SQL database credentials, your SolarWinds Customer Portal account, your AWS credentials, and Windows local admin server credentials. 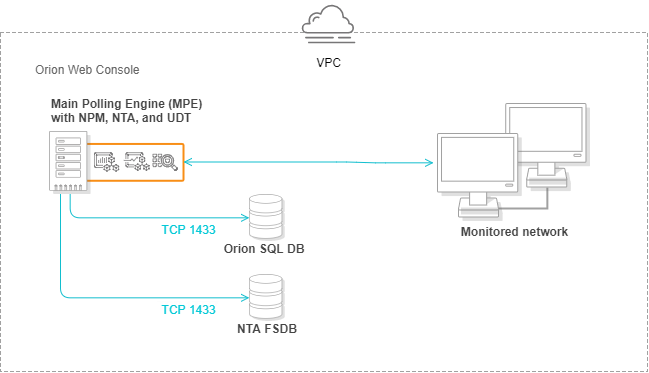 Create your VPC Create the VPC that will contain your SolarWinds Orion environment. Define the security group for your Orion environment. All SolarWinds Orion components installed in the cloud, such as your main Orion server, Orion database, and APE, must be part of the same security group. Define ports in the security group. For your server ports and firewall, open ports according to the port and feature requirements. Orion uses these ports to send and receive data, issue management commands, and additional actions depending on the features. For example, SolarWinds High Availability has additional port requirements beyond product needs. For more information, see Amazon's help. Additional Polling Engine servers: see the SolarWinds Scalability Guidelines. Additional web server: see the SolarWinds Scalability Guidelines. NTA 4.4 requires an instance of SQL Server 2016 SP1 or later for a Flow Storage Database. The Flow Storage Database can either be co-located with your Orion database on a single SQL server, or can be installed on a dedicated server. The deployment method is dependent on the size of your environment. Review your DNS settings or your hosts file to ensure that you can successfully resolve hosts names, including LDAP servers for user authentication, in your environment. Recommendation: Renew. SolarWinds recommends renewing you maintenance to receive the latest upgrades and installs for all products. Sign in to your Amazon EC2 console and launch an instance according to your recommended deployment size. Save and run the installer.exe on the server dedicated to your main Orion server. Product-specific checks for configurations and additional requirements. For more information, select Click for more details. Select Save Install Report to save a list of issues to resolve. You can also select Copy the issue to clipboard to paste the details in a text file. Products begin installing with messages for the progress. The installer displays any issues, halting the installation to allow you to review and fix. The installer may run multiple product installations prior to running the Configuration wizard. Installations requiring the Configuration wizard open and walks you through the installation steps. 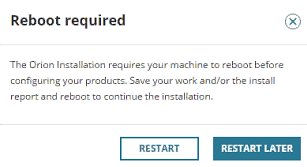 You can run the SolarWinds Orion Installer again to check for updates. Authenticate as currently logged in user: pass through authentication to the SQL server using the account currently logged in for installing the Orion product. We do not support creating a new SQL account through the Configuration wizard when the database is in the cloud. Review the list of services to install, and click Next. Log in to your Amazon Web Services S3 account. Log in to your Amazon Web Services account. You can perform the following steps through the API or AWS command line interface. If the DNS does not resolve the host names in Amazon's AWS, update your hosts file. Create an Amazon Virtual Private Cloud. AWS does not support the use of a virtual IP address. As a result, Orion High Availability cannot be deployed in AWS if both members of the same HA pool also reside in the same subnet. Each member of an HA pool must be deployed into a different subnet. A virtual hostname (using, for example, Amazon's Route 53 or Amazon's ELB) can be used to direct users to active member of the HA pool. See Amazon's help for more information. Create or update security groups. Download and install secondary server hardware. Check our Success Center for troubleshooting. SolarWinds recommends searching the name of the product, the version number, any error codes or messages displayed, and the general issue you found.